Living on wheels enables us to move with the seasons and sleep and rise with the rhythm of the sun. We follow the push of the swell along the coastline and venture into the mountains when it's hiding away. We feel a part of the landscape like the roads are mapped on our hands all the way to our fingertips. 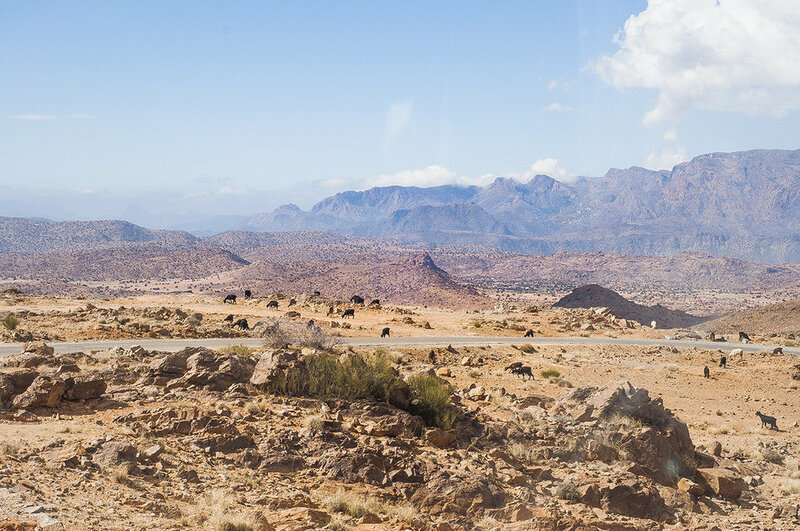 This is a glimpse of our life on wheels travelling through Morocco in North west Africa. We hope you enjoy it, more videos are in the pipeline! We decided to take a break from the coast of Morocco and head inland to the Lower Atlas mountains. As we approached we knew we heading somewhere special.. The air became fresher, more crisp and cool.. we drove through remote rural communities and pretty much every individual we passed would greet us with a wave, big smile or both! However we weren't prepared for the sheer beauty and atmosphere that this part of Morocco possessed.. it really blew us away as we slowly and steadily made our way up the winding roads passing herds of sheep and goats, their shepherds weathered and seasoned from the rocky undulating terrain. Almond trees in blossom were a real treat to witness and gave a delicate touch to the views on offer from our windows, adding to the pastel palette of pinks, purples, oranges and blues with hints of green from Argan trees. There were too many photo opportunities to count, at every turn we were greeted by a whole new vista, Matt would say to Steph "hop out and I'll drive down here, it would make an epic photo" or Steph would travel with our friends behind for a while to capture the van in the landscape. A definite highlight of our trip down to Africa we would love to spend more time there in the mountain air, satisfying our souls.